A Wisconsin-based contractor who performed work at the Miami Intermodal Center pleaded guilty this week and paid $3 million in criminal and civil fines for defrauding the federal government. The charges stemmed from Novum Structural LLC claims that it used materials forged and manufactured in the United States for at least three federally funded projects: The United States Courthouse in Rockford, Illinois; a street car expansion in New Orleans, and the $2 billion Miami Intermodal Center (MIC) by Miami International Airport. Instead, Novum used cheaper goods manufactured in China, said Milwaukee attorney Brian Mahany, who represented whistleblower and former Novum employee Brenda King. “We know in Miami they were substituting goods and making a profit on it,” Mahany told The Real Deal. According to King’s lawsuit, filed in August 2012, Novum collected nearly $15 million for fabricating and shipping materials used in the construction of the MIC. That project required the materials to be made in the United States, unless a waiver was filed, in accordance with the 1933 Buy American Act, which requires materials in federally funded projects to be manufactured in the United States as a means of protecting American jobs. Instead, “many of these components were manufactured in The People’s Republic of China,” the suit says. Michael Hernandez, spokesman for Miami-Dade Mayor Carlos Gimenez, said the MIC was a project overseen by the Florida Department of Transportation. FDOT spokeswoman Maribel Lena did not return a phone call from TRD. Loften also said that “non-compliant materials represented less than 3 percent of the value of work Novum did on projects subject to the Buy American requirements,” according to the statement. 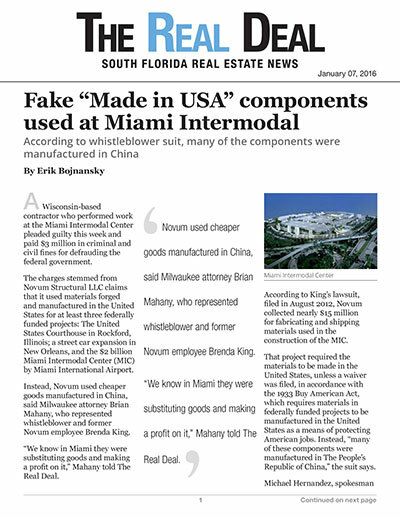 During that same month (November 2011), Collins told King to “falsify a quality manual for the Miami Intermodal Center to indicate that the company was following a 100 percent traceability standard of all components to insure that all components were made in the United States,” the suit says. King also witnessed employees repackaging components to make them appear they were made in the U.S. After complaining to her supervisor, King filed a whistleblower lawsuit under the False Claims Act. Her suit was soon taken over by the U.S. Attorney’s Office for the Eastern District of Wisconsin.